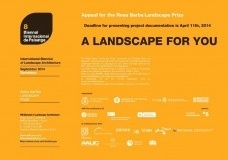 The Rosa Barba Landscape Prize, sponsored by Banc de Sabadell, will beannounced within the framework of the 8th Barcelona Landscape Biennial which will take place on the 25, 26 and 27th September 2014 in Barcelona. The Rosa Barba Landscape Prize is opened to all kinds of landscape projects and planning created worldwide from 2009 to 2014. Deadline for presenting project’s documentation is April 11th , 2014. There is a sole AWARD, which has an economic value of 15.000 euros. It will not be declared void under any circumstances. The Prizewinner and the finalists will be presented during the symposium. The projects selected by an International Jury will be published in the 8th Landscape Biennial Catalogue and exposed in the Rosa Barba Prize exhibition. Lun a Sáb de 10h a 20h30.